Fantastic on everything. Perfect service, great prices and really well supported throughout the ordering and delivery process. Recommending to all my friends. "Very pleased with Direct Mobiles"
Very pleased with Direct Mobiles. Quick delivery and my daughter very happy with her new iphone. Good communication via email when I had a question. Easy to change her number over too. All in all very pleased and it was much cheaper than other deals. "Excellent Service from Direct Mobiles"
Direct Mobiles gave me excellent service, friendly polite people to speak to for an enquiry. Kept me up to date on my order once placed and I love my phone and the contract. Wow! What a great service, my phone arrived the next day and it is so easy to order from Direct Mobiles. Contract information is clear and the checkout process informative. Definitely the best price plan for my choice of phone and data usage. Well done and keep up the top work. Excellent service! Applied for a new phone and it only took 2 days, also came with some Haribo which was a nice touch. Phone works great and I'm on a good deal. I went for the £10 EE Flex deal which gives me 2GB of data. If you don't use it, then it rolls over to next month. You can use the allowances from within the EU with no problems. My sim card arrived the next day and porting my old number was very easy. Recently took delivery of my EE SIM only deal. It was the easiest thing to order on their website. No credit checks as some sort of flex deal that I'd not seen before. Coverage good so far, no issues at all and cheaper than going with EE direct. I decided that it was necessary to upgrade my phone to a new iPhone 8 and searched all online offers to find the best buying option. Direct Mobiles was my preferred choice, their prices were the best and their ordering process consumer friendly. I ordered the phone on their website and I am extremely happy that I chose them. They offer excellent client service and my phone was delivered on time. The phone was exactly as ordered and their setting up instructions was of great value and made the task simple. Their customer service helped me to choose the best plan for my needs and their friendly service was a great help. They saved me a lot of money and time that I would have spent visiting shops to find the best mobile deal. 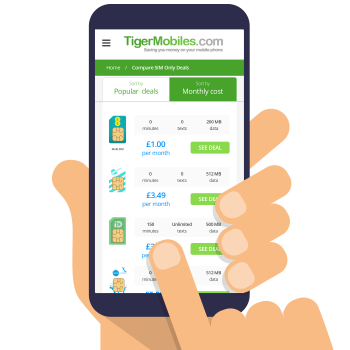 I can recommend Direct Mobiles to anyone wanting to purchase a new phone. You can do it from the comfort of your home, like me. My daughter needed a new mobile phone for university so I decided to take it out on my account due to her lack of credit history. Got her an iPhone 7 and it was done & dusted in minutes -- really intuitive website, easy to find the thing you need and plenty of deals. I found a great deal with Direct Mobiles and placed the order. It was very quick and easy and was all processed on the same day. Received it early the next day as I was told I would. I am very impressed with the company and the person I spoke to very polite and helpful nothing was too much for him to help me with, the phone and deal are amazing very happy customer. What can I say? I couldn't be happier. I was initially a little discouraged that the providers offered were limited to EE, but I ended up with a better deal from EE than I would have had I approached them directly. My new Samsung S8 was delivered free of charge the next day, which was a Saturday so not even a working day! Great customer service. 10/10 and I would recommend these guys to anyone. What attracted me to direct mobiles were the super cheap prices. I have searched online all over and I can say they have the best deals, but not the best reviews. Even so, I ordered the iPhone 7 from them, paired it with a EE 24 month contract and saved a lot of money than by buying the phone in a physical store. As expected, the order didn’t arrived the next day and the customer service wasn’t very helpful. But I still think it’s worth it, especially if you’re on a budget like me. I needed a present for my daughter that would arrive fast and I ordered the new iPhone 8 online from Direct Mobiles. They were doing “deal of the week” so I got a pretty good deal that also included free next day delivery. I wasn’t sure what plan to choose, so I reached out to their customer service who were glad to talk me through different plans and advised me what to opt for. I went for the best-selling plan that has unlimited minutes and texts, as I’m sure my daughter will be using this a lot. Smooth experience, I’d buy again! I went to Direct Mobiles because they have the best deals for EE phones. EE are a pretty cheap mobile service provider and so are Direct Mobiles, so it's like making a double saving. They seem to have some kind of special relationship and I was very happy with my deal. Delivery ok too.